Have you been hot, sweaty and struggling to sleep in the heat? 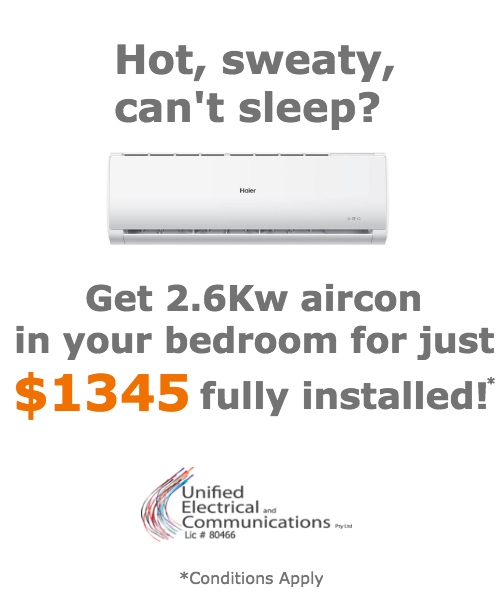 Well we have the perfect home air conditioning special offer for you! We can have your air conditioning installed quickly and efficiently by one of our fully qualified, friendly electricians anywhere in Brisbane. Contact one of the team today to get your aircon installation booked in. N.B. The price quoted is for a single story, back to back air conditioning installation. To view the full terms and conditions of this offer click here. Take a look at our other air conditioning special offer and find out more about Unified Electrical’s air conditioning installation options.